Principal Cast : Michael Keaton, Michelle Pfeiffer, Danny DeVito, Christopher Walken, Michael Murphy, Pat Hingle, Michael Gough, Vincent Schiavelli, Anna Katerina, Paul Ruebens. Synopsis: When Gotham comes under attack from the mysterious Catwoman, and a disfigured freak named Oswald Cobblepot runs for Mayor, Batman must once more enter the fray to stop his city becoming a war zone. What we think : Exceptionally dark Batman film is utterly superb from opening frame to close. Teeming with iconic motifs and nods to the comic character’s long history, as well as taking audiences on an utter nightmare of a journey into the duo of villains here, Batman Returns is perhaps the second best Batman movie after 2008’s The Dark Knight. 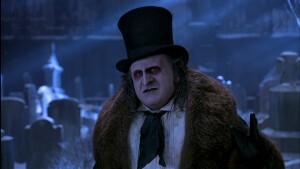 DeVito, especially has yet to be topped as The Penguin. Dark, brooding, malevolent. And that’s just Batman. Batman Returns is the Empire Strikes Back to Batman’s original Star Wars. 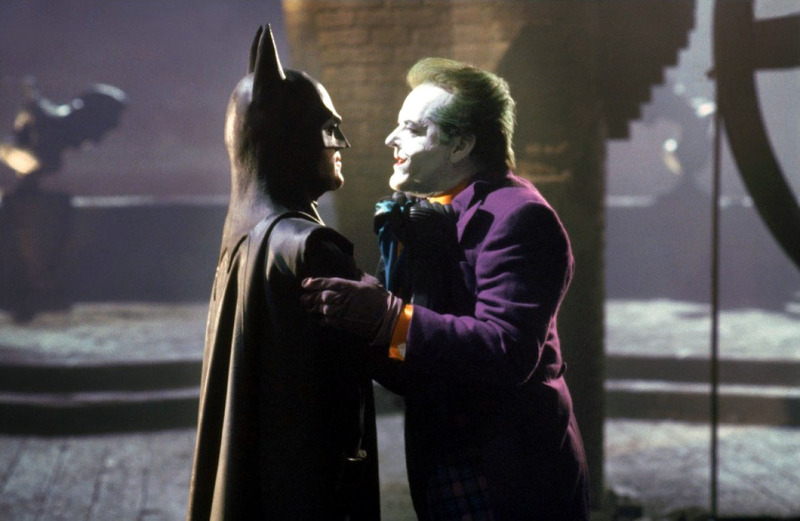 That’s no small feat – Burton has a spotty history with maintaining his creative drive, and after Batman’s monumental success, naturally Warner Bros threw a boatload of money at him (and Michael Keaton) to make the sequel. Rather than just throw something together quickly, Burton and his production team – screenwriter Daniel Waters and producing partner Denise DiNovi – crafted a story that would make a genuine sequel better than the original. 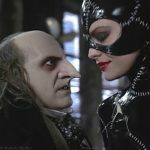 Burton took a couple of Batman’s most famous adversaries, Catwoman and Penguin, and following the template of the original film, gave them origin stories that added a layer of sympathy for audiences to connect with. Like Batman’s Joker, with Catwoman and Penguin Burton wanted us to feel for them, to acknowledge that they were products of their circumstances, not just cartoonish, campy adversaries for Batman to defeat with a punch. 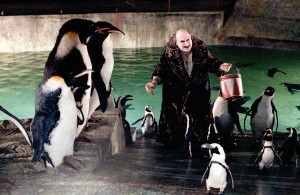 After being cast out by his parents, a young child grows up to become a freakish sewer-dweller known as the Penguin (Danny DeVito), the leader of an organized gang called the Red Triangle Circus Gang. After a brutal encounter with Batman (Michael Keaton), the Penguin, who learns his birth name is Oswald Cobblepot, decides to run for election as the new Mayor of Gotham, using underhanded methods to ensure his eventual victory. Meanwhile, Selina Kyle (Michelle Pfeiffer), the secretary of powerful Gotham businessman Max Schreck (Christopher Walken) is tossed from a window when she uncovers something she shouldn’t in her boss’s work, and suffers a psychological break, becoming a thieving burglar under the pseudonym Catwoman. As Catwoman and Penguin join forces in an uneasy alliance, and Bruce Wayne romances Selina Kyle (without knowing who she really is), Batman must once more fly into action to prevent the city he loves from being destroyed by the plans of the nefarious Cobblepot. Rewatching this a decade after last doing so, I had forgotten just how dark Batman Returns really gets. I mean, this film f@cks with the minds of all our main characters, and the journey into madness reaches its nadir with Penguin’s eventual reverting back to the screeching, hobbling maniac he begins the film as. The tortured souls on display here, from Bruce’s continual hand-wringing over his parents death, to Selina Kyle’s break from humanity after being betrayed by somebody she respects, to Cobblepot’s resentment of the world which cast him down into Gotham’s sewers: there’s not a bright spot anywhere to be found in this film, at least not from a character perspective. In saying that, it’s meaningfully dark, as Tim Burton attempts to examine what makes Batman a good guy, and Catwoman and Cobblepot villains, when they’re essentially similar in both loss of humanity and decision to dress in costumes and prowl the dark. While I’d hesitate to say the examination is a success, largely due to Burton’s astonishingly brazen visual themes here, it’s certainly a film you could spend a lot of time discussing and breaking down to dredge out all the gristly chunks of subtext were you so inclined. 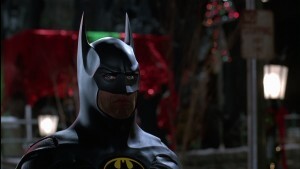 In fact, much like its predecessor, Batman Returns is a film where Batman is reduced to a second-tier character, a supporting role in his own movie, such is the focus Burton gives to Catwoman and Cobblepot. As I mentioned in the opener, Burton makes both Catwoman and Penguin enormously sympathetic, utterly complex to the point where they become less villainous in the true sense, and more tragic in the romantic sense. Cobblepot’s unfortunate physical deformity at birth castigates him to a life of torment and building hatred, as he resents those who “disposed” of him (us, really, as a metaphor for acceptance and our inability to find the beauty in what we think as “ugly”), while Selina Kyle’s rampant vigilantism against misogyny and her misplaced sexuality is interesting from its inherent duality with Batman. Neither Catwoman nor Penguin are easily written off as “bad” inasmuch as they’re products of events beyond their control, so a measure of sympathy is gleaned from both Michelle Pfeiffer’s devilish performance and Danny DeVito’s career-best portrayal of the characters. I think it’s this sympathy we have for them that makes Batman Returns such a shock-wave of emotion for the audience, and partially why I find this film so utterly dark. 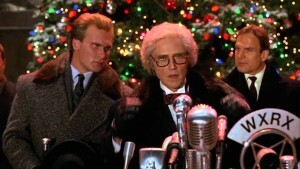 Most hero films have a moment of redemptive quality to them, a moment where the villain must make a choice between the Bad Way and the Right Way, however Batman Returns serves up a nightmare of neverending Bad Way choices through sheer coincidence or external pressure. The “villains” never have a chance at true redemption, for the world they live in won’t accept that. It won’t allow it. And Batman’s attempts to convert them into the right path end up a shattering failure. While Batman eventually defeats the machinations of Cobblepot, his inability to help the man from his pathway to evil is the melancholy with which this film wraps the audience with and drags it screaming into the dark. Any longtime reader of Batman’s comic adventures will be familiar with this dehumanizing style of story, as close an approximation to a cinematic acid trip into hell as one wants to get – especially for a major mainstream hero film in the early 90’s, which only makes this a more remarkable feat. Burton “gets” Batman perhaps more than any other director – he knows it’s not the hero who is especially interesting, but his villains that define him. Batman effectively becomes passive in this film, rather than an active participant in proceedings, as Burton spends a vast amount of screen time developing Kyle and Cobblepot to get us to…well, not like them, but understand them. Burton delivers an even darker Gotham City than we witnessed in Batman. Here, Gotham is a dank, snow-blanketed crime zone, a dangerous spatter-pattern of alleys and avenues on which death is dealt almost nightly. Returning bit players in Pat Hingle (as Commissioner Gordon) and Michael Gough (as Bruce’s trusty butler Alfred) provide links to the previous film, as does Michael Keaton once more appearing as the titular hero, but all of them are buried beneath Burton’s suffocating style and Pfeiffer and DeVito’s magnetic performances. DeVito is the one I want to talk about. Normally I’m not the short guy’s biggest fan, as I find his performances aggressive and belligerent more often than not. Here, Burton uses DeVito’s physicality and stature to its most effective – he’s a short, stumpy, flipper-handed freak, and DeVito is superb. The role demands a range of emotion I doubt I’d seen from him at that point – certainly not in the years since – and of all the monstrous creations Burton has ever put on screen, I don’t think one has affected me like his Penguin. That soul-rending screech when he realizes that Batman has thwarted his plan to not only become Mayor but also kill off the upper class children of Gotham’s elite is heartbreaking, and coupled with the gorgeous makeup design is sold with DeVito’s hissing, spittle-projecting devastation. Only minutes earlier we’d seen him wistfully wander a Gotham Cemetery, longing to know why his parents abandoned him the way they had – it’s a beautiful scene filled with sorrow and menace, a potent combination made so much more nightmarish with Burton’s use of color (or lack of, as it were) and Danny Elfman’s haunting score. Look, Batman fans will understandably hold up Christopher Nolan’s The Dark Knight as a “perfect” Batman movie, and I’m hard pressed to argue the point with them. But spare a thought for Batman Returns, a film that undeniably turns the superhero film on its head (back in 1992, no less) and creates a fully fleshed world of darkness and human suffering unlike any we’d seen to that point. Some might claim it as too melodramatic for its own good, to suffocatingly depressing, but Batman isn’t all sunshine and rainbow farts, guys, so to see him have to deal with more greys than black & white is a refreshing change. 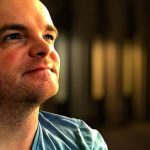 Batman Returns has some minor quibbles – like Batman, the model work and visual effects don’t quite stand up under today’s high-definition scrutiny, but as a product of its time is still quaintly charming – but at its heart is a superbly rendered, fully fleshed out world that is as darkly malevolent as it is cruelly fantastical. Excellent review. This is indeed a dark piece of cinema, one that actually took years to appreciate. Unfortunately, this is to blame for the two crappy Batflicks to follow. Warner Bros. overreacted to anxious parents who had no clue what they were getting into when they took their kids to this and brought in Joel Schumacher to lighten things up and, well, he gave us Batcrap. Great review. Yeah, that decision by WB was baffling in hindsight. 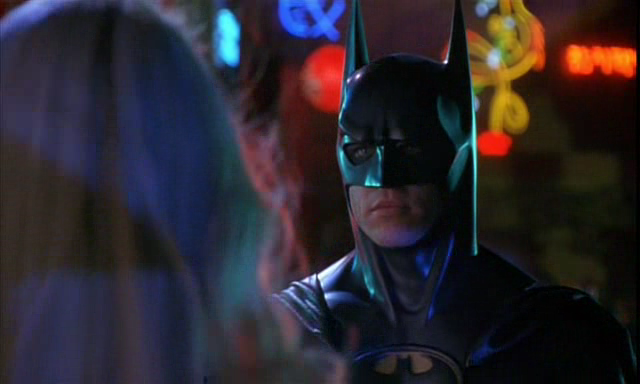 I guess the numbers for Batman Forever were good enough to make them feel vindicated, however. As I said in my review, DeVito's performance here is soul destroying for the Greek Tragedy of it all.